Outsourcing to other virtual assistants. Having an associate. Hiring a VA’s VA. Becoming a MultiVA. Whatever you call it, 38% of the UK’s Virtual Assistants want to add to their team by subcontracting to other VAs in the next 5 years (Source: UK VA Survey v9). Virtual Assistants are great at telling clients that they should outsource, but we are rubbish at taking our own advice! I very rarely do training for VAs – I’m too busy running my own VA business, and I don’t need the extra income because (luckily!) it’s a very successful business. I’ve done this for over a decade, but I was very flattered to be asked by OIVAC to present on how I work my systems to ensure I get the best out of my subcontractors. It’s something which is badly handled by most of the VA trainers because, (sorry – I’m not going to mince my words or win many friends here! ), mostly they’ve never done it in properly themselves. If they have done it, it’s been short term, and they wouldn’t necessarily have set up their systems to deal with some of the long term issues which can arise. Ability to grow your business – there’s only 24 hours in any one day, unless you figure out cloning or how to survive on zero sleep, you cannot grow your business without extra help. Do the tasks that you enjoy – get rid of the stuff you dread doing (for me, that’s bookkeeping!). Be flexible with your workload – I get to go do the school run most days, safe in the knowledge that it’s all being taken care of in my absence. Take on bigger projects – especially when you are combining different skill sets, so you would act as project manager for the client and combine all the different specialists. Cover for you as a solopreneur – sickness, holidays, maternity leave! As part of your business model – whilst some VAs only outsource when they have overflow work which they can’t complete for their client; others will outsource as part of their business model… We call VAs who outsource more than 50% of their workload “MultiVAs”. Make more money! Kinda obvious that one, but a big motivator! Why aren’t more Virtual Assistants outsourcing? Roughly 25% of VAs outsource some work – but that means that three quarters are true solopreneurs working entirely alone (Source: UK VA Survey v9) So why aren’t more virtual assistants outsourcing? Now sometimes this is down to the Lead VA not specifying clearly enough what was expected… And sometimes it’s just outrageous behaviour from the subcontract VA! But hopefully this article covers a few of the most common pitfalls and what to look out for. Number 1 thing: Do NOT do it under time pressure! This is how I do the outsourcing… And a lot of what I’m going to write relates to who you shouldn’t hire because there are thousands of VAs out there, and one is the right one for you! There is no need to accept substandard VAs, they will cause more headaches long term. A job description: You’d be surprised by how many people skip this off their To Do List. Write down a job description of your ideal VA – will they be local, have certain skills, be reliable, available at particular times, able to type at 100wpm? If your candidates don’t match these criteria – DON’T HIRE THEM!!! You have time here, if you think you are perhaps asking too much of one person, do two separate job descriptions and hire two people. Knowing what you want is the first step to getting it. The tests: This saves me a lot of hassle speaking to people who wouldn’t have the skills I need. Once you have your job description, design a test for them to submit along with their CV when they apply. It might be a spelling test, a task they must complete, a simple piece of research. It should be a short task – I’d suggest under half an hour, because after all you aren’t paying them for this. It’ll give you an idea of what they are capable of. And here again: If they don’t pass the test, DO NOT HIRE THEM. You will spend your entire life checking their work and you’re maybe missing out on working with an excellent VA! A contract: This is NOT negotiable. Before they find out anything about your business or your clients, they need to sign a confidentiality contract – it protects both you and your clients. SVA has a template for this, but whatever you use, make sure it’s not a US based contract, as the UK has very different laws on restraint of trade and “golden handcuffs” clauses. Including these types of clause in your contract could very well make it null and void and unenforceable under UK law. Additionally, you need to make sure your VA is definitely self-employed, rather than an employee – again the UK is much stricter on this than the US, so you must make sure it is very clear in the contract as it will protect you from becoming liable for National Insurance contributions etc. Your contract will most probably be tweaked to suit your business – make sure a lawyer checks it over when you make these changes for full peace of mind. Using the template will take hours and £££s off your bill though! Availability: Over the years I’ve gradually reached the conclusion that people with less than 20 hours a week are no use to me. It’s perhaps a personal niggle, but I can pretty much predict that if you hire someone with less availability, that when you have work for the outsourcer, they won’t be able to help you. Plus there may be times when you urgently need to get hold of them to query a bill, something they did for a client, where they saved a piece of work etc – if they aren’t available until next day, it could really screw you up. If you’re going to spend time training them, you need to get a return on investment for that. If they are never available to work, you won’t be seeing the returns for a long, long time. Training: Once you have your VAs in place, you need to teach them how you do things – give them templates, give them guidance about how you work, FAQs clients might ask them, set them up with an email address that you have access to which they should use for all your work (this saves a lot of hassle when it comes to managing absences). Set out how you are going to work – will they tell you their availability every Monday morning? When will they get paid and what do you need on their invoice? Check they have Microsoft Office, proper anti-virus software plus anything else they would need to complete work for you. Tell them you won’t pay more for a task than your estimate unless they contact you and give you the option of reassigning the work to someone else. It’s a good idea to document this set up and have it saved somewhere – it makes it easier to outsource next time too. I call this setting out the rules of the game: this is how we play it here. Sort your systems: If you need the VA to share documents, have access to internal information, have an email address set up in your company name, set it up now! Ideally, you should retain control over the area and be able to grant / revoke access whenever you need to. You’ll also want to think about billing – when should they invoice you so you can safely have enough time to check it and invoice your clients the right amount? Do you need them to tell you how long each piece of work has taken them, or do you have somewhere they should record this centrally? VERY IMPORTANT: Even if you don’t get paid by your client, the VA was hired by you, so you still have to pay them! Outsourcing Your Own Tasks: Their first task should always be an internal one – this gives you a massive indication of how they usually work without risking any client contracts. Tell your clients: If they are used to dealing solely with you, they are going to freak out being handed off to someone unknown… Introduce your new VA in your monthly newsletter perhaps with a little bit about them and their expertise. Explain individually to the clients that you’ll remain responsible for their work, but that you are getting some extra help from your new VA in order to improve the service (you could say give them quicker turnarounds, improve quality, allow you to focus on more strategic elements of their work). Back off: This is one I’m particularly guilty of myself… We all have an inner control freak. Keep it under control – unless you figure out how to clone yourself, no one is ever going to do everything exactly how you would do it. The main thing is that your instructions are clear on what is not open to interpretation. Anything else – well that’s your own fault for not specifying! Lastly, be prepared for extra admin time: You’ll need to set aside extra time for checking the work before it gets sent back to clients, and you’ll also need to build in admin time for paying them and organising the schedule. I sometimes call this part of the job my “Fat Controller” role – a la Thomas the Tank Engine. My job is to make sure the trains are in the right place, at the right time, with the right equipment. It often feels like I’m not a VA but simply managing traffic of tasks through the system. 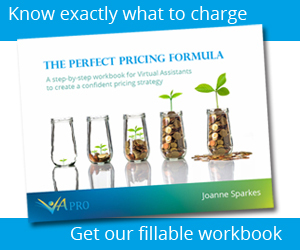 It’s a major change from being a VA doing admin – and not one that everyone enjoys. But you MUST set aside extra time for this as part of your outsourcing. 40 hours a week from you plus 20 hours a week from your Associate does not equal 60 billable hours… I’d suggest about quarter of the time you outsource will be taken up by managing the tasks. Back when I first started outsourcing, I used to think the personal side was important… I’d try and find someone I liked working with. But to be entirely honest, unless that person also has great skills and availability, I should not be wasting my time even speaking to them… Get the tests done and the contracts signed and THEN figure out if you like working with them. Our current failure rate on our grammar and spelling test is around 80%. That’s from people who think they are ready to work for us, often ones who are already working as VAs. All tasks should be outsourced in the same way – you should give a brief description of the task, any passwords or resources they need to complete it, a rough indication of how long it should take them, a deadline (leaving enough time for you to check the task and if necessary re-do it), how they should return work to you, and ask them to acknowledge receipt and that they can do the task as outlined. Please acknowledge receipt and acceptance of these terms. Outsourcing like this leaves very little room for error – remember our list of outsourcing nightmares? We’ve just dealt with most of them, in one simple email. Oops – something’s gone wrong!!! How can you stop this mistake from happening again? Hopefully you’ll have built enough space into your deadline that the client remains unaffected. You’ll probably not have had very much sleep and are probably rushing all your other work as a result… but the client is unaware there was a problem. It’s not a disaster – be calm in your approach. Firstly, tell the VA. If you’ve had to correct a document, send them the finalised document with highlighted mark up showing them where you’ve made changes and where they’ve gone wrong. Next: figure out how you can stop this mistake happening again. Were you unclear in your explanation? Did the VA have the wrong template? Was there a personal drama? Did they have a technical malfunction? For example, one of my very reliable VAs found that her new anti-virus was removing attachments from emails she sent – and I didn’t get the work. Her solution to this is to also send it to herself and forward us that file from her Blackberry if we have a problem receiving it. If the mistake has cost me money, I usually give the VA the choice of either not charging me for their work or I’ll pay their bill, but I won’t work with them again – mostly VAs want to work and won’t charge you. At this point I also make it very clear if they were in the wrong, that if they screw up again, there are no second chances. I work to tight deadlines, my clients expect great work – I can’t have people who let me down on the team. Occasionally we have a second problem – and at that point, there’s simply no excuse. They are unreliable, I can’t work with them. They have to go. Fool me once, shame on you – fool me twice, shame on me. My own story: We had a VA doing call answering for us – she rather stupidly decided to approach one of the clients about doing some VA work on the side for him (against our contract terms as she should have passed this info to the head of dept who deals with VA work). Not only did our client immediately come to tell us, but she also gossiped about it with one of the other VAs in our private chat room! She claimed we’d misconstrued what she’d meant in the chat room, but the fact was she hadn’t followed procedure and therefore was in the wrong anyway. Try to do it nicely (say you’ll take them back on once their situation is more settled if it makes you feel better) but under no circumstances should they work for you again. Remind them of their contract and its terms regarding confidential materials or contacting clients. It’s sad but true – some people are not suited to being a VA. However there are hundreds of really excellent ones out there and you deserve to find one to help you in your business! UK VA Survey – Annual survey of UK virtual assistants run by Society of Virtual Assistants each year and acting as a snapshot of the industry together with statistics and rates information. Next articleWhat Are You Worth? Caroline Wylie is the founder of the Society of Virtual Assistants (SVA), the largest membership organisation for virtual assistants (VA) in the UK. The SVA aims to connect VAs of a certain standard with businesses of all sizes. The society’s latest annual UK VA survey is now available for purchase here.